Mount Vernon, VA Southbound Exit: 177A to Route 1 S, Northbound Exit 163: Do you have what it takes to lead like Washington? Visitors to his Mount Vernon Estate now have a chance to put themselves in Washington’s boots and experience first-hand the leadership challenges that he faced on the battlefield and in the presidency. “Be Washington: It’s Your Turn to Lead” is a new first-person interactive experience that allows visitors to come face to face with a leadership challenge that George Washington also confronted as commander in chief or president. Listen to advice from his most trusted sources and make your decision. Inside the immersive 1,200-square-foot Be Washington theater, participants take the role of George Washington as they seek to solve one of four crises that Washington faced. Events of the Revolutionary War and presidency come alive on a massive 30-foot 6K-resolution screen. 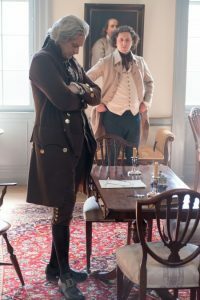 Chris Jackson, the actor who played George Washington in the Broadway hit “Hamilton,” will introduce each of the plots onscreen and will later describe the course of action that General or President Washington took. Each scene takes about 18 minutes to complete. Featured scenarios include the Battle of Second Trenton, the Whiskey Rebellion, the Genet Affair and the Newburgh Conspiracy. As you learn about the situation, participants hear insights and opinions from some of the same historical advisers that Washington would have had access to, such as Thomas Jefferson, Alexander Hamilton and Henry Knox. As they sift through differing recommendations, they are asked to rate each adviser’s persuasiveness. At the end of each segment as Washington, the participants have seconds to vote for which course of action they would take to solve the crisis. All votes are then tabulated and shared on the main screen. Washington’s decisive actions at key moments helped to shape our history. Discover if you would have made the same tough choices. This entry was posted in Articulture, Entertainment, exhibition, History, Military, Museum, Special Event, Theatre, Virginia and tagged action, adviser, Alexander Hamilton, Battle of Second Trenton, battlefield, commander in chief, estate, Experience, first-person, Genet Affair, George Washington, Henry Knox, Historical, History, interactive, leadership, Mount Vernon, Newburgh Conspiracy, participant, plot, presidency, President, Revolutionary War, scenario, situation, theater, Thomas Jefferson, Virginia, visitor, Washington, Whiskey Rebellion, “Be Washington: It’s Your Turn to Lead". Bookmark the permalink.